A total of 19 people have been arrested in a document forgery operation linked to migrant smuggling in Europe. 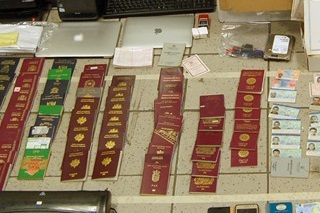 The arrests - 19 in Greece and three in the Czech Republic - stem from a Europol operation against organised crime groups involved in "the massive production and distribution of falsified or forged documents." The documents were shipped through courier companies to EU Member States and other countries in Africa, the Middle East and Asia, according to Europol, and were subsequently provided to irregular migrants to enter the EU or to legalise their stays there. Special Report - European Migrant Crisis: Impacts on the Supply Chain - download here. The Athens-based criminal network - which centred on Bangladeshi and Sudanese gangs - sold documents for €100 to €3,000, depending on the quality of the forgery and the type and country of issue. The documents forged by these two criminal groups included passports, national ID cards, Schengen visas, driving licences, asylum seeker's registration cards and residence permits. Europol Director Rob Wainwright said: "In the last two years we have seen criminal gangs increasingly investing more in the production of fake documents to support a growing criminal market associated with the migrant crisis." "Document fraud is now a highly important enabler of organised crime operated by groups involved in stealing or producing counterfeit passports and other travel documents," he added.